Electrical and battery-powered gadgets are great, but if you live in a sunny place, why not harness that energy and put it to use? Solar technology is improving, and now there are several gadgets available commercially that don’t need an outlet or battery – just a few hours outside soaking up the sun. Solar energy is sustainable, inexpensive, and a great way to power your life. 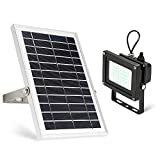 The next time you go to plug in a lamp or replace some AAs, think about whether or not you could power these items a different way, and consider purchasing some of the solar powered tools listed below. These are great for camping, hiking, or even road trips. They are also great for leaving at your home for guests when you host them or when you yourself are traveling. Your wallet and your environment will thank you. A floodlight is great for any backyard or porch, especially when you are out of town but want to keep your home safe as it can deter thieves. This particular light is also good for camping. It illuminates the darkness and adds an extra layer of security for anyone who isn’t comfortable in the dark. This solar light includes absolutely no electrical connection. You can either enjoy lower lighting (280 lumens) for eight to ten hours or brighter light (400 lumens) for four to seven hours. It has an automatic on/off and is waterproofed for outdoor use. A few of these strategically placed lights will offer you some eco-friendly illumination all over your property. It even comes with an included mounting kit for easy set up on any support beam, sidewall, or garage. 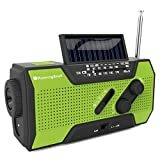 If you are a camper, hiker, or just someone who likes to be prepared in the event of a power outage, then this solar powered radio is perfect for you. There are actually a few ways to charge this – either through solar power, hand crank, a micro USB cable, or 3 AAA batteries. With one tool alone you can listen to AM/FM radio, illuminate the darkness through an included flashlight, or charge up your smartphone through the included USB port. The radio is small, lightweight, and easy to transport, so you can keep it on you all the time. The mini solar panel is more powerful than you might think! Be prepared and at the ready with this solar powered emergency radio. Has this ever happened to you? The power goes out and suddenly you find yourself desperately searching for the flashlights you haven’t used since last summer’s camping trip. Once you finally find them, you flip the switch only to realize that the batteries are dead. Instead, invest in these solar powered flashlights with a battery backup. All you need to do to charge them is to let them sit in the sun for a few hours. This also makes them a great choice for camping trips. The next time you find yourself searching the back of your junk drawer for the spare batteries you threw in there years ago in order to see in the darkness, remember these solar powered flashlights and never worry about your ability to banish the darkness again. 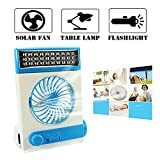 This little personal fan is great for a small tent or a bedside table, and the best part is you don’t even need to plug it in! The solar panel soaks up the solar energy and converts it into power that spins the fan and cools you down. The fan also features an LED lamp with a plate cover that helps you to adjust the angle of the beam. It is compact and easy to transport and even easier to charge. One reviewer said it really helped circulate the air when he went camping and recommends it. Nothing is more frustrating or anxiety producing than your smartphone running out of batteries in the middle of a busy day or camping trip. Instead of flipping airplane mode on and off, stretch your phone’s battery life with this solar powered battery bank. The four attached solar panels unfold to create a large panel for charging, and can conveniently be folded back up for compact transport. As long as the sun is out, you will never need to worry about the availability of a charging outlet again. Just lay out the solar panels during the day, and charge your smartphone (read: lifeline) at night. Nothing makes your outdoor or indoor space cozier than a string of delicate lights. 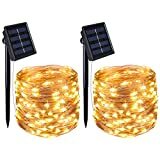 This three-foot strand of twinkling yellow lights charge via a petite solar panel. They are completely waterproof and an excellent choice for a campground or patio. Or you could easily leave them on a sunny windowsill for charging indoors. If you are looking to up your cozy factor without tying up a free outlet or having to burn a fire, then grab these delicate and inexpensive little string lights. As you can see, more and more objects are coming with solar power capabilities. These are great for being eco-friendly. But they are also great for camping, extended trips, hikes, or festivals where access to electricity is limited. Grab these gadgets, harness the power of the sun, and free up all of your outlets!